Saudi education minister Monday fired Mohammed al-Hathri, a secretary and educational chief after authorities and the population were stunned by school text book image showing ‘Star Wars’ character Yoda sitting right to King Faisal during signing of the UN Charter in 1945 when he was foreign minister. Education Minister Ahmed al-Eissa told the New York Times that it is an accident and added that new copies were being printed. Authorities have started collecting the text books intended for social studies on the United Nations. The presence of the green Jedi master stole credit from the iconic and historical Saudi monarch who he is still popular in the kingdom today. 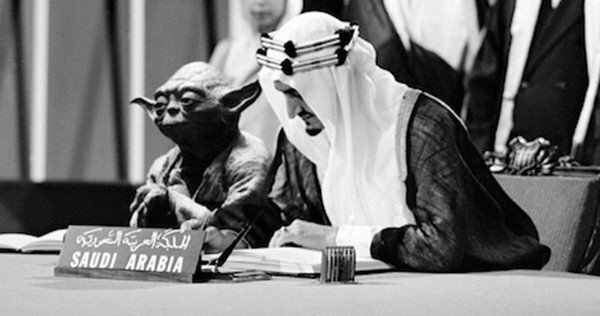 Saudi artist, Abdullah Al Shehri well known as Shaweesh who is author of the image indicated that he was proud of the photo of Yoda sitting next to the King Faisal. He said he holds esteem for both arguing that they ‘”wise, strong and calm”. Shaweesh also noted that did not mean to offend anyone but suggested that someone should have checked the book before it went to publish.